Pour over coffee methods have been around for decades but over the last few years they have become more popular than ever with at-home brewers. This rise in popularity could be a result of coffee drinkers wanting a better cup of coffee than a standard drip machine can give. Another major factor is the growing interest of at-home brewers to be involved in every step of the process. Pour over brewing methods not only give you more control over each step (i.e. your water, your grind, your flow rate, etc. ), but also it allows you to tweak and play with your recipe, zoning in and improving on that daily cup until it's exactly the way you like it. In this article we will go over the basics of pour over brewing as well as the different types of pour over drippers Brewista offers. For detailed instructions and recipes for our drippers, take a look at the quick start guides on each product page. First, let’s understand what pouring over your grounds means compared to immersion or steeping methods such as Aeropress®, press pots, and steeping filters. As you will notice, our pour over drippers have holes in the bottom and there is no valve. The shape of the dripper and the size of the hole(s) are major factors in the outcome of the coffee because they determine the flow of water through your grounds. This allows for percolation of your coffee; a constant flow of fresh hot water is going through those grounds rather than sitting and staying for a while. Because of this, your pouring method plays an important role in the outcome and works with your grind size to create a steady flow of coffee into your cup or server. Pouring from too high above your grounds creates too much agitation in the grounds and can over-extract them. A steady pour is important and a gooseneck spouted kettle, while not necessary, can help make consistent pouring easier. Pouring your water into the grounds rather than on the wall of your paper filter is also a helpful tactic to accurately extract your grounds. When done with a pour over brew, your filter should have a crusting of grounds along the entire wall. If all the grounds are sitting at the bottom of your filter, your beans might have been ground too finely or your pour was too vigorous. To get started with pour over brewing at home, there is a small set of tools you will need along with some tips and guidance. Let’s start with going over the tools and variables in making a good cup of joe then look at the pour over vessels themselves. For many, a “perfect cup” depends on how you like your coffee. There is no right or wrong way to brew but there are some measures you can follow that can help you narrow down what that perfect cup of coffee is to you. A few things that almost every barista can agree on is to always start with fresh water, fresh beans, and clean instruments. You will need a scale, a kettle, a thermometer (if your kettle doesn’t have one), freshly roasted beans, a grinder, a pour over dripper, a filter, and a vessel or cup to catch your brew. While this may seem like a big investment at first, many of these tools will last years, and none of them are too steep in cost. The SCAA (Specialty Coffee Association of America) states that there are 7 pillars of preparation, or as I like to call them, variables. They are as follows; the method of brewing, ratio, grind, water, contact time, temperature, and filter (may help to make this a bulleted list). Getting familiar with these variables is a great place to start before making pour over coffee. A good ratio to start out with is 1:17 by weight, coffee to water but many enjoy a 1:15, 1:16 or 1:18. Next in importance is grind which directly effects how extracted your brew will be. If your grind is too small, water will not be able to flow through at a good rate and your dripper could get clogged. If your grounds are too big, your hot water is going to pass through your coffee too quickly and result in a weak, under extracted cup. A good rule of thumb is to start with a medium grind for our drippers, but you might need to tweak this as you practice brewing depending on what you find tastes the best. Water needs to be fresh and right off the boil, the window of temperature for brewing coffee is 195° F – 215° F. Contact time is the amount of time the water is in contact with the grounds. We recommend a total brew time for lighter roasts to be 3-4 minutes, and 2 ½ to 3 minutes for dark roasts. Because you are pouring water from a single source rather than a shower head in a drip machine, the water is a couple of degrees hotter. This allows for the quick extraction that results from pour over brewing. Lastly, your filter; you will need a paper filter that corresponds to your dripper. There are full cone paper filters, flat bottom filters, V filters, metal filters. Always make sure you are using the right filter for your dripper so that water can adequately percolate through your grounds and into your cup. Keep in mind that the thicker the paper, the slower the drip and the longer the contact time. Each of these variables are dependent on one another to make your cup of coffee. It's important to remember to only change one variable at a time when trying to improve your recipe. For instance, if your coffee tastes weak, try changing either the grind size, the ratio, or the contact time, but don’t change all three at once. It might help to write things down at first, then once you have a recipe you like, your methods will become habit and you will easily be able to make your “perfect cup” of coffee half-awake every morning; this, of course, is the ultimate goal. Now that we have covered the tools of the trade and some helpful guidelines, let’s walk through the types of pour over drippers we offer. At Brewista we have put a lot of time and research into making a handful of highly functional drippers that work amazingly well and look great in your kitchen or coffee shop. Our flat bottom dripper is a less common style of pour over dripper. Because of its wide base, grounds have the potential to be extracted a little more evenly, resulting in an excellent cup of coffee. The flow rate is determined by 3 small holes in the base. Our new tall basket filters work perfectly with this dripper but standard small basket filters work great as well. You will want to keep your kettle spout close to the grounds so as to not over-agitate them. Pre-infuse your coffee, then begin slowly pouring the remaining water in after your bloom. Pouring slowly and steadily, is ideal, but it’s not necessary to be pouring the entire brew time (3-3 ½ minutes). Some people prefer to pour 50-70 grams at a time, with 20-30 second breaks in between. This dripper is great for handling slightly finer grounds while using standard filters. Our new tall basket filters are engineered to help make a more even extraction and will allow your coffee to dispense a little slower, thus a slightly coarser ground will work best. With our filters, you can get a cup of coffee with more roundness and complexity because of a more even extraction. We also offer a V cone dripper that uses standard #4 flat cone style filters. This is a commonly used pour over style that offers a great cup of coffee consistently. This dripper is great for bright, fruity coffees and quick, clean extractions. We recommend a medium to fine grind when using this dripper. Pour your water fresh off the boil, bloom your grounds, wait 30 seconds, and then continue with a slow and steady flow onto your grounds. Too vigorous of a pour will cause all of your grounds will fall to the bottom, making an over-extracted cup of coffee. Your cup of coffee should drain by 3 ½ minutes, if you are using a coarser grind, up to 4 minutes might be an adequate extraction time as well. For full cone brewing, we offer a Full Cone Dripper, and 3 sizes of Full cone Hourglass Brewers. A full cone dripper requires the most practice and although it is considered by some to be the expert level of pour over coffee methods, it is a perfect way to highlight fruity, acidic, light roast coffees. Because of the wide hole at the bottom, your pour must be consistent and last 3 minutes. With the last of your coffee dripping through at 4 minutes at the longest. Your water is going through your grounds, filter, and into your carafe or cup as quickly as you pour. We recommend starting with a medium to medium-coarse grind size to help regulate the flow rate. Altering with your grind and rate of pour will help you zero in on the best recipe. This type of pour over enables the varietal to really show through, so each bean and grind might act a little differently and require fine tuning. Inspired by a classic design that has been around for decades, we have made our full cone drippers out of double-walled glass with a silicone base. 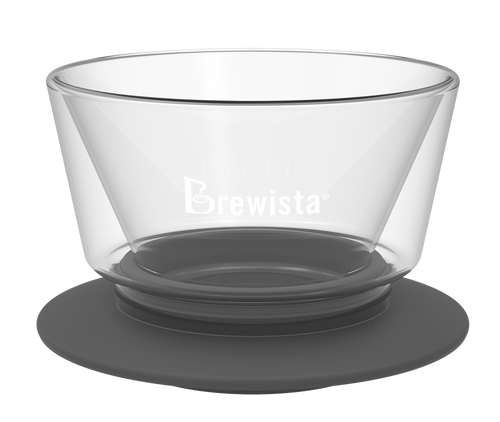 The double-walled borosilicate glass helps insulate the coffee while it’s percolating and the base keeps the dripper from sliding around on your cup or server. Our Hourglass brewers are essentially drippers with built-in carafes. This keeps your coffee warm and enables bigger brewing batches than a single cup. Our hourglass brewers are uniquely designed to hold any filter because of the ridges along the cone. There is also a glass valve that prevents the filter from suctioning against the walls, so brewing with this hourglass works very well. Our steeping filter offers a different type of brewing along with the durability of BPA free plastic making it ideal for any adventure. Unlike the pour over drippers, there is a valve that you turn, opening or shutting the outlet that allows your coffee to pass through into a cup. This tiny difference makes this dripper an immersion brewing method. Turning the valve and shutting off the outlet allows your coffee grounds to steep rather than passing though the grounds at your rate of pour. The purpose of this steeper is to take the hassle out of having to pour perfectly over your grounds because you no longer have to maintain a steady rate and pour style with your water. You can use any type of kettle and speed of pour, fill to your desired amount of water, set a 3 minute timer (from start of pour), and once time is up you simply turn the orange handle and your coffee will dispense within the minute into your carafe or cup. This steeper is an ideal method for those who are either new to pour overs, or don’t have interest in mastering the slow and steady concentric circles that a full cone dripper tends to need. This steeper is one of the easiest ways to get a delicious cup of coffee. Ideally you will still need a scale and timer to get your brew zoned in but when you’re out camping or on the go, 3 scoops of medium ground fresh beans and water filled to the top of your paper filter should make a delicious 16 oz. cup of coffee in 3 ½ minutes. Check out our Drippers and Steepers and click on the Quick Start Guides for full instructions on how to make the best cup of coffee with each dripper. Thanks to the following great resources on helping with this Article: Prima Coffee, Stumptown, Seattle Coffee Gear, and Serious Eats, H+S Roasters, Sweetbloom Coffee Roasters, Shenandoah Joe’s, and the team at Brewista.